Moto-crossing through Iran, the Turtles, Splinter and Ninjara find a port and secretly board a ship heading to their next destination: Oman. From the ship they glimpse the oil fields of Kuwait, still burning from the Gulf War that ended a year ago. Splinter laments that the burning oil is only one of the prices of war; as another six million gallons spilled into the Persian Gulf. Several days later, traveling across the deserts of Saudi Arabia abord five camels, Splinter tells Michaelangelo that their next destination is Al Hadidah, the Valley of the Fallen Stars. Ninjara has heard of the place and the Black Stone of Mecca. The Black Stone is known among thieves as the fifth hardest thing in the world to steal (just behind the Mona Lisa, the Hope Diamond, the Roswell alien corpse and, ha ha ha, a woman’s heart). Arriving in Al Hadidah, they set up camp in one of the two massive craters and Splinter tells them the tale of the Black Stone. The Black Stone fell from the skies in that very spot and the pre-Islamic Arabs of Mecca built a structure called a Ka’ba to house it. As time passed, the religion of Islam spawned around the Ka’ba and Splinter proceeds to tell the tales of Muhammed and Abraham. The Ka’ba currently resides in Mecca which is, unfortunately, off limits to non-Muslims. Splinter reveals that their next destination is a hill overlooking Mecca, so that they might glimpse the Ka’ba from a far. The next day, Ninjara tells the story of the White Stone, which landed in the other crater in Al Hadidah. The White Stone had been secreted away by Nomads before the Meccans had discovered the Black Stone and for three thousand years it has been bought and sold by the wealthiest people in the world. Meanwhile, those who have owned the White Stone have tried unsuccessfully to steal the Black Stone, as it is said that once they are joined, the owner will be granted immortality. Story-time is cut short by an approaching caravan of six travelers on five camels. The Turtles act natural and bid a good day to the passing Arabs. The leader of the caravan, however, fears he recognizes the strangers he just passed and dismounts, ordering his followers to continue to Al Hadidah without him. 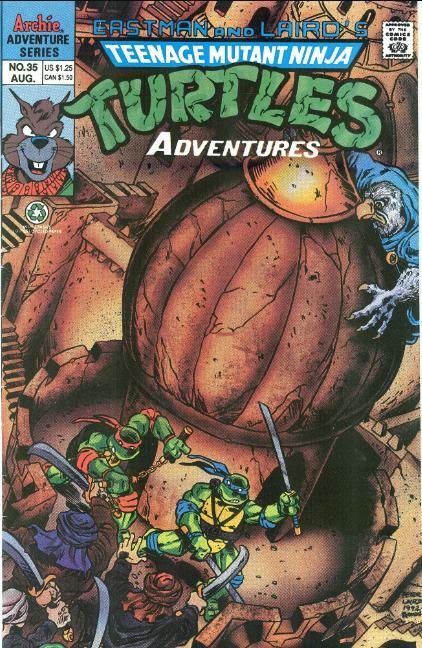 Meanwhile, the Turtles arrive at an abandoned desert city to camp. Little do they know, they are spotted by a falcon who brings word of their presence to a falcon-man named Al’Falqa. Later, the Turtles are suddenly besieged by a horde of sword-wielding Arabs and a fight breaks out. 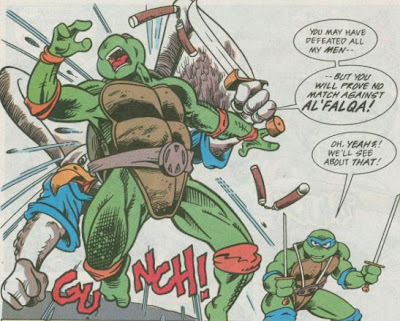 Al’Falqa storms the scene, taking Michaelangelo from behind, accusing the Turtles of stealing the Black Stone. Unfortunately for Al’Falqa, his men are defeated and the Turtles, Splinter and Ninjara surround him, forcing him to surrender. Al’Falqa explains that a caravan of six travelers on five camels, just like them, had stolen the Black Stone. Leo realizes that it must have been the caravan they passed on their way to the abandoned city. 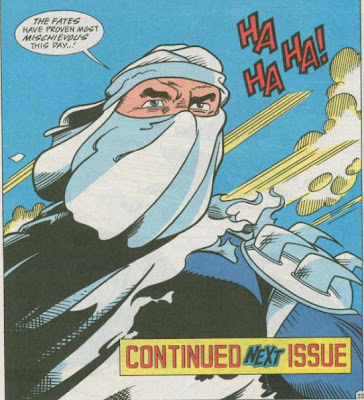 Suddenly, a sandstorm kicks up and the Turtles, Ninjara and Al’Falqa seeks shelter in a building. Splinter doesn’t make it in time and passes out in the open. From a distance, the leader of the caravan watches the incident through binoculars. The wind tears away a portion of his robes, revealing him to be… the Shredder! *This story is continued from TMNT Adventures #34. The story continues in TMNT Adventures #36. *The Shredder last appeared in TMNT Adventures #25. *This issue also featured a pin-up map tracking the Turtles’ path across the Middle East and a pice of bonus art, "Teenage Mutant Ninja Inky", by Eric Talbot. *This issue also contained a back-up story, "Mah Name! ", by Clarrain and Allan. *This issue was published in the UK by Fleetway as TMHT Adventures #70. Wow. 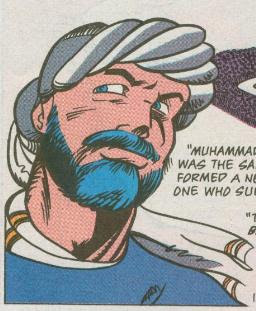 Chris Allan totally drew Muhammed in this issue. Hard to believe that TMNT Adventures got away with something that even South Park couldn’t, but that’s just evidence of how much religious and cultural tensions between the United States and the Middle East have changed since this issue was published nineteen years ago. Like the previous arc, which focused on educating readers about Buddhist beliefs and culture, this arc makes an effort to teach kids about Islamic practices, beginning with a crash course on the history of Islam. This time around, though, the implementation of the history lesson is done with much less grace, as it becomes a wall of text that absorbs an entire page of the comic. To be fair, Clarrain (Murphy) seemed aware that he was treading too deep into “The more you know…” territory and the Islam 101 session ends with all the Turtles and Ninjara bored into a deep slumber as Splinter prattles on and on and on. In the letters page of the previous issue, Clarrain explained that Splinter does not practice any single religion, but instead learns and appreciates all the spiritual values of the world. That theme is certainly evident throughout this “world tour” arc, as thus far we’ve had Splinter lecture us on the Japanese creation myth of Izanami and Izanagi, the Buddhist belief in the Charlie Llama as the reincarnated Buddha and now the Islamic tale of Muhammed and the significance of Mecca. I suppose if you take a step back and look at the arc in that light, it might rub off as preachy, “Hey kids! Did you know there are other religions besides Christianity? It’s true!” However, I found the execution of this theme to be done fairly well, and aside from the occasional wall of text, the educational elements were worked into the entertainment pretty seamlessly. Clarrain still finds time to wag his finger at the environmental impact of the Gulf War, but at least that only takes up a page of content instead of an entire issue. Like Katmandu and Chien Khan before him, Al’Falqa has no origin explaining just what the Hell he’s supposed to be. He’s just a weird anthropomorphic bird fluttering around the Middle East and nobody bats an eye. While I like the idea that in the world of TMNT Adventures lots of animal-people populate the Earth in secret and aren’t an entirely uncommon thing, I sort of miss the early days of the title when they were at least given origins. But I suppose long-winded origin stories take up page space better reserved for the plot of the adventure and we’re just supposed to accept the presence of other anthropomorphic critters as a given and move on. Of course, the real excitement comes from the return of the Shredder, but more on that next issue. Ollerenshaw’s back on inks, but the ugly mouth wrinkles are gone, so I presume someone told him to knock that crap off. With most of the story taking place in a barren wasteland, artist Chris Allan has to make do with keeping the pages energetic and exciting through the characters… even though they spend most of the story standing around telling stories. As such, it’s probably not the most visually interesting issue of the series, though the entirely-too-short battle at the abandoned desert city is quite good. Allan puts a number of brutal touches into Al’Falqa, as he takes Mikey from behind, punching him off a balcony and then proceeds to take Leo out fairly quick, followed by stomping on him with his boot and pressing a sword to the Turtle’s throat. Alas, it's hard to take him seriously when I keep misreading his name as “Alfalfa”. This was another one of those "oh wow, that cover sure looks awesome... but wait, how come nothing exciting like that happened in this issue?" books. Back in the day, I was really hoping to see an epic sword fight across an ancient cityscape. But, fortunately, that last page reveal of Shredder got me sooo psyched with anticipation for the next issue that I didn't mind so much that all my $1.25 bought me was a history picture book. Bobby Curnow was somewhat aloof with his explanation for the exclusion of TMNTA #32-37, but I'd put good money on the "sensitive" nature of the World Tour arc being the reason. The first half deals with Red China oppressing Tibet and the second half deals with the origin of Islam (including that drawing of Muhammed which is a hot button issues, these days). Keeping in mind that IDW included an apologetic note in their first Tales of the TMNT trade because the word "Mecca" was used in Tales #3, it seems they're likely very antsy about offending the Islamic faith. I don't think there's anything keeping #32 and #37 from being reprinted, but they likely fell by the wayside because the 4-issue format of the trade paperback series made dividing up the arcs more difficult. Oh wow, I thought I was being a bit of a conspiracy theorist, but that Tales #3 example is very telling. Frustrating that this occurs right at the point where I stopped following the Archie series as a child, but I certainly understand if IDW doesn't deem a niche reprint worth the hassle that this could bring them.